Beginning today and ending Monday night, April 22nd, at midnight, Family Tree DNA will be having an extensive DNA Day Sale. Of note, both mitochondrial Full Sequence and Family Finder upgrades will be included, which seldom happens. Family Tree DNA is taking this opportunity as well to announce technology upgrades in their sequenceing equipment. If you have been considering either, this is a great sale and a good time to order these tests. Family Tree DNA’s announcement to project administrators today is provided below. We are pleased to announce our 2013 DNA DAY Promotion.While the special pricing features all the major tests, we’re placing particular emphasis on the Full Mitochondrial Sequence and Family Finder. We’ll offer Y-DNA upgrades during a Father’s Day sale and will give you those details at that time.By carefully choosing the sale options and limiting the length of the sale, we will be better able to focus our resources on processing the tests efficiently and avoiding delays in delivering results. We are proud to announce we have successfully moved our mtDNA Full Sequencing line from Sanger DNA sequencing to what is called Next Generation Sequencing (NGS). This gives us much greater capacity to process tests, to reduce costs without sacrificing quality, and to ensure shorter turnaround times. We must run the entire sequence every time we process an mtDNA full sequence test, even for upgrades. However, in recognition of your prior investment- and National DNA Day – we’re offering our lowest price ever for the FMS and upgrades. Rather than the 8-10 weeks first generation sequencing required, we expect results to be completed within 5-6 weeks. This does depend on the number of orders received though. If their DNA is already at our lab, those who order first may expect even shorter turnaround times. For a limited time we will be selling the FMS for $189 and whether you’ve tested HVR1 or HVR1+2, you’ll be able to upgrade to the Full Sequence for just $129! 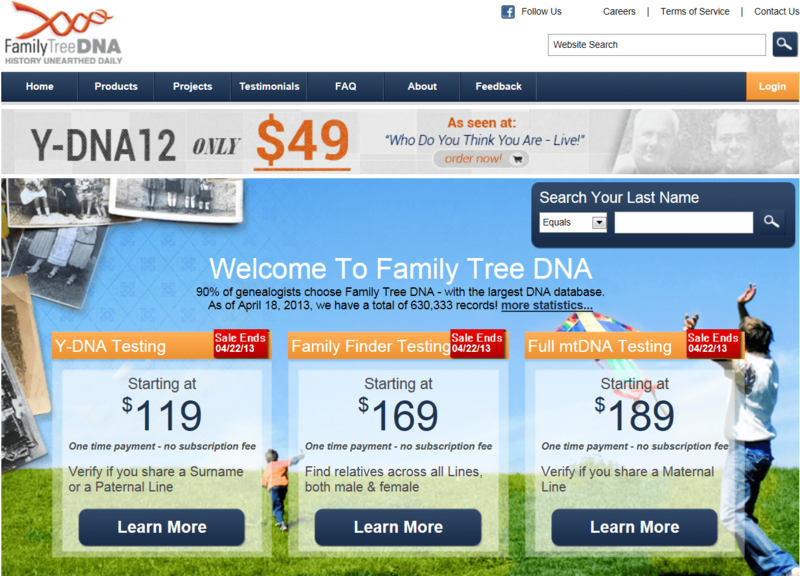 In addition, we are also lowering the Family Finder to $169 for this sale! There will be no need for a coupon – all prices will be automatically adjusted on the website. This entry was posted in Uncategorized and tagged Historical or Obsolete by Roberta Estes. Bookmark the permalink. I have done the Geno 2.0 and the 23 and me test. Will I get any appreciable benefit out of doing another test at Family Tree DNA? I have already done the MtDNA HRV 1 and 2. I am beginning to feel overtested. It depends on what your goals are for testing. If you have lots of HVR2 matches, then the full sequence would think those greatly. Also, it will provide you with your full haplogroup if you are interested in deep ancestry. Regarding the Family Finder test, yuo can transfer your 23andMe results for $89. Then Family Tree DNA treats them like their own test results and you get your ethnicty map and your cousin matches. Again, depending on your goals whether this is what you want. In general, for autosomal testing, fishing in all the pools is the most beneficial approach, but if all you wanted from testing was the healthy info, then no, don’t test at Family Tree DNA for autosomal.